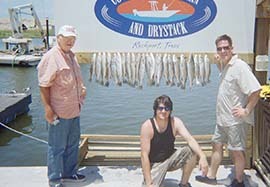 Fishing Port Aransas is always fun. We will be fishing the outside beaches of Traylor Island, the very shallow water flats of Estes, and maybe the deeper water of Corpus Christi Bay depending on the time of year and the weather. If Mother Nature is really kind we might even get out around the jetties and catch Trout in the surf or Kingfish off the end of the jetty. The close proximity to the gulf means you never know what you’re going to catch on any given day. I leave from Fisherman’s Wharf. I’ll pick you up at the back of the dock and upon return, we’ll have your fish cleaned and packaged at Fisherman’s Wharf. They can even freeze your fish and keep it stored until you’re ready to head home. There is a small charge for the fish cleaning that is not included in my fishing prices. Port Aransas does not have place for me to clean fish at the dock. I also can not take airboat trips from Port Aransas. We can’t cross the deep channel safely in an airboat. 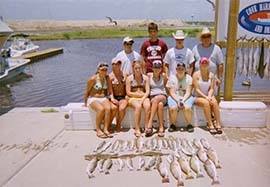 All charters from Port Aransas are from my 24 foot Kenner. If you want an airboat trip, you’ll have to drive to Aransas Pass or Rockport . The airboat is an amazing trip. It runs on dry land and many times we are parked on the bank and fishing back lakes no one can get to without an airboat. It’s a unique trip and a lot of fun! I try to catch as many fish as I can for my customers. I do not come back to the dock if we limit out very early either. If we limit out on Redfish or Trout first, I’ll try to find you something else to catch and keep fishing. 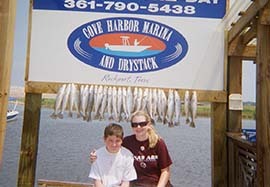 Fishing in Port Aransas is very good. If you’ll listen to me and let me tell you the best way to catch fish, we should do well. I can’t control Mother Nature, but I’m on the water almost every day and I keep up with the fish by staying on them and I usually know where they are. 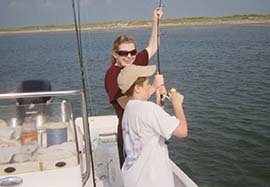 On all my trips you will need a fishing license if you’re over 16 years of age. Make sure they give you the Redfish tag. Ask them to show it to you. It’ll say ” Valid for one Red Drum over 28 inches”. If you don’t see it, you didn’t get it. It’s sad when customers catch a good Redfish and can’t keep it because the clerk at the licensing store didn’t print the right tags. You need to bring a cooler with your food and drinks. Please no bottles. You’re welcome to drink beer, but the bottles can break and cause problems. Also, remember to bring your sunscreen, hat and sunglasses. We have a lot of sun and it’s great but it’ll burn you very fast. If you’re flying in and don’t have a cooler, I can provide one.